San Diego’s East Village sits shoulder-to-shoulder with the Gaslamp Quarter, but personality-wise, the two Downtown ‘hoods are like a pair of young and old sisters, NOT twins. While most of the Gaslamp Quarter is stuck in time and populated largely by tourists and conventioneers, the East Village -- San Diego’s largest urban neighborhood -- is quickly turning into one of the coolest places for Downtown locals to live, work, and (most importantly) feast. Take a look at these 10 tasty eats from some of the newest restaurants, bakeries, and juice shops in the East Village and see for yourself. 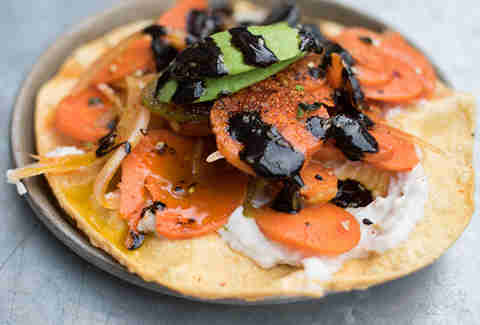 We know you’re going to opt for meaty (or fishy) options for tostadas at Común, and you absolutely should -- but don’t forget about the lone veggie option, with hominy purée, carrots, jalapeño, avocado, and morita-sesame salsa. The flavors are a little bit sweet, a little bit smoky, a little bit Asian, and 100% DELICIOUS. Go on Tostada Tuesday, when all tostadas are $4 a pop. This splashy new spot in the Thomas Jefferson Law School is significantly more grown-up than your standard pizza-and-pasta shop -- but that doesn’t mean you can’t eat a classic plate of spaghetti and meatballs. 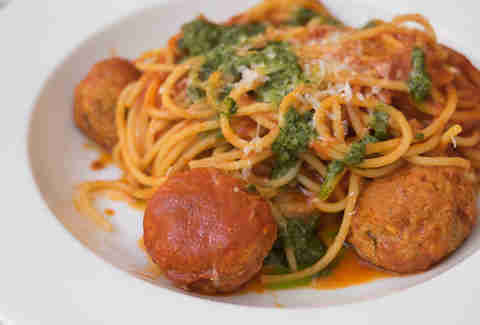 Thanks to the fresh, house-made pasta, super-tender beef & pork meatballs, and flavorful, five-herb pesto, it’s quite a few steps up from the noodles you noisily slurped as a kid, but just as satisfying. 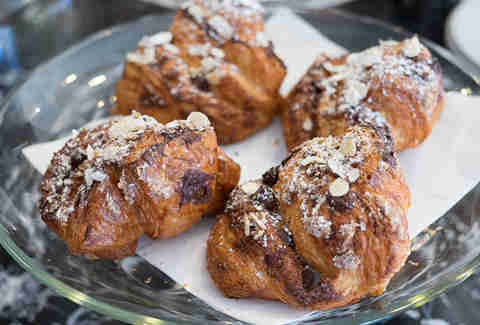 Next door to Sol Cal, grab a buttery, flaky croissant. It’s just the thing to counterbalance the so-healthy-it’s-probably-too-good-for-you parfait. The sweet almond paste and dark chocolate croissants aren’t always on offer, but if they are, grab one (or two!). Otherwise, all of the traditional options (butter, almond, and chocolate) are worthy. Pro tip: ask for whichever flavor is fresh out of the oven, or have your croissant warmed up. 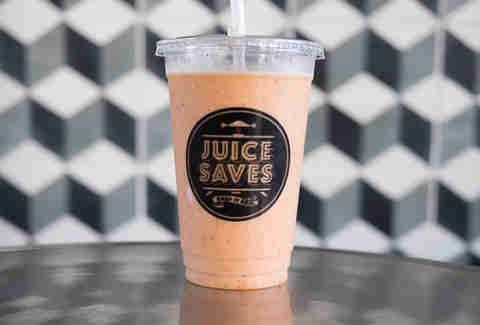 This bright new vegan restaurant and juicery draws a health-conscious, yoga-pant-clad crowd, but even if your favorite meal is burgers with a side of burgers, you have to try the acai parfait. The fluffy, mousse-like mounds of house-made coconut yogurt with acai purée, fresh berries, and granola make this bright bowl of healthy goodness a great choice for breakfast or lunch, whether you’re a strict vegan or um, not. 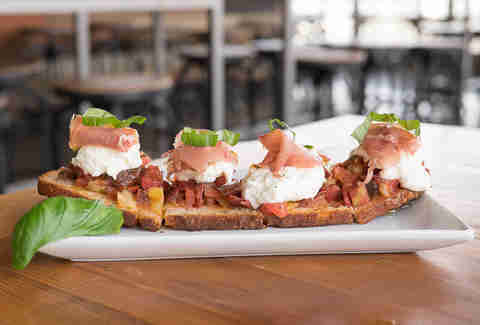 Halcyon’s fresh-baked bread puts its bruschetta head and shoulders above most restaurants, but factor in razor-thin slices of prosciutto, diced heirloom tomatoes, hydroponic basil, and mounds of fresh, house-made burrata and it’s really something special. 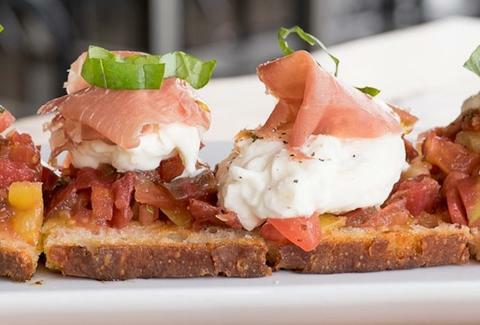 Think of it as an open-faced sandwich and order it for lunch -- often. There are so many tasty things going on in this dessert, it’s worth making a trip to the second-story restaurant for the doughnuts alone. 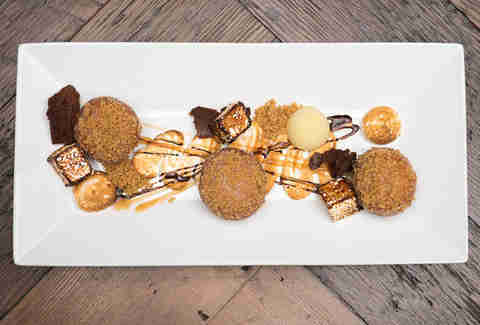 You'll find toasty cubes of brûléed marshmallow and torched marshmallow cream, plus vanilla custard, dehydrated chocolate mousse (which looks and tastes like brownie chips), and ganache-filled mini doughnuts rolled in crushed graham crackers. Yum. Anyone who loves cheese (so, everyone...) will appreciate this killer appetizer from Stella Public House. 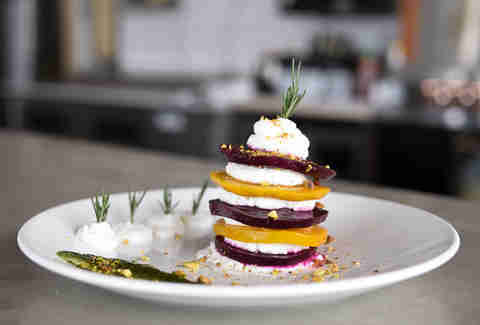 It's got tangy whipped goat cheese stacked between slices of earthy red and golden beets marinated in red wine vinegar. We’ve done the math, and it’s more cheese than beet, but you can still feel good about eating your vegetables. The restaurant will be open for lunch soon, but in the meantime, score this tasty plate for $8 during happy hour (5-7 pm, Monday-Friday) or at dinnertime. Muscle strength and an energy boost are touted as benefits of this meal replacement in a cup, but we think you should order one because it’s just flat-out delicious. Frozen banana and almonds are blended with half a bottle of your choice of cold-pressed juice ("Grow A Pear," with pear, carrot, orange, and pineapple juice, is a good choice). BONUS: you get to walk out with what’s left in the bottle, which makes the $10 price tag a lot easier to swallow. Heirloom cherry tomatoes, Gioia mozzarella, basil, and a mountain of lightly dressed arugula so large it’s like a complimentary side salad top this paper-thin pie served on a sheet pan at Double Standard -- a stylish new spot located on the Western-most edge of East Village. 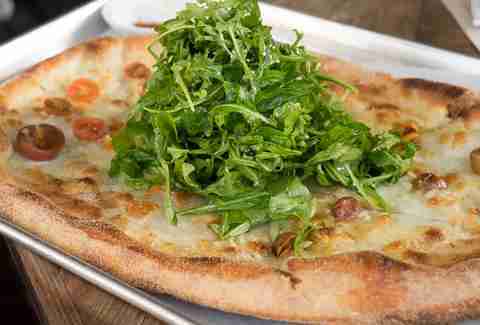 You’re going to need to order the pork belly and prosciutto bruschetta, too, but in terms of pizza, this is the one to get. 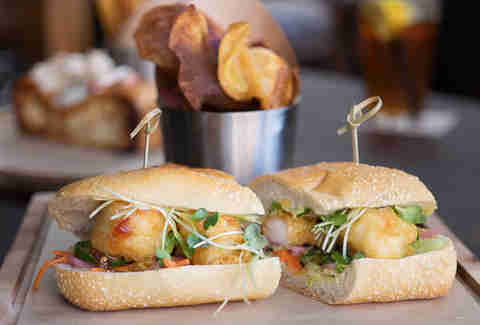 Plump and juicy tempura-battered shrimp hangs with cucumber salad, daikon sprouts, pickled red onion, and sweet chili sauce on this non-traditional but totally tasty bánh mì sandwich served with house-made chips. Bonus: it also happens to be one of the most budget-friendly lunch or dinner items going.